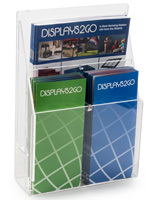 This 2-pocket booklet display is designed as a literature holder with tiers so that both magazines are easy to see. The clear fixture is made of acrylic for easy viewing of information placed inside. 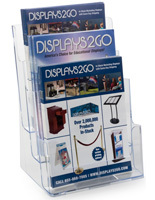 The booklet display with 2.6” deep slots allows for plenty of leaflets to be stored inside to run out less frequently. 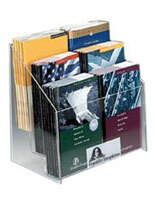 The literature holder has 5.5” wide compartments that easily showcase smaller magazines for customers. 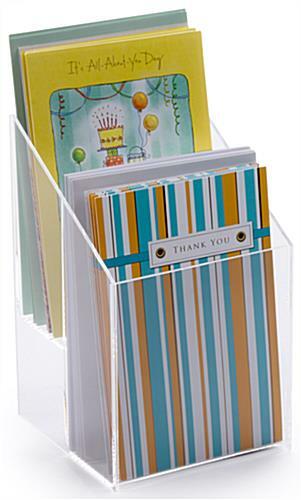 The display is made of clear acrylic in order to be durable when placed in busy settings. The 2 tier fixture takes up a small amount of space wherever it is placed! 6.0" x 9.3" x 6.3"